The miner filled his pack with a few more rocks chipped from the rock slab, scooted out of the ‘coyote hole’ on his belly, and grimaced from the bright sunlight as he edged his way back onto the surface. He had chipped on the quartz vein for a couple of years now and the coyote hole had grown to a little more than 10 feet deep. The vein had pinched and swelled a couple of times and the richer pockets were located in the fatter sections, adjacent to the rock wall. To him, it seemed that the vein was getting wider again, which meant there could be another rich pocket of gold ahead. He remembered when he first found the vein. It was a warm August day and he and his dog were on a hike in the woods near the Plumas-Sierra County line. They had no special destination other than to hike up a steep slope and check out the view. About two-thirds the way up the slope, he stopped in the shade of a tree and sat down on a rock outcrop to rest. After taking a swig from his water bottle, he wetted his bandana and wringed out the excess water. As it splashed on the rock, a bright golden glitter caught his eye. Lowering himself to his hands and knees he looked closer, his eyes grew bigger and his jaw dropped open. 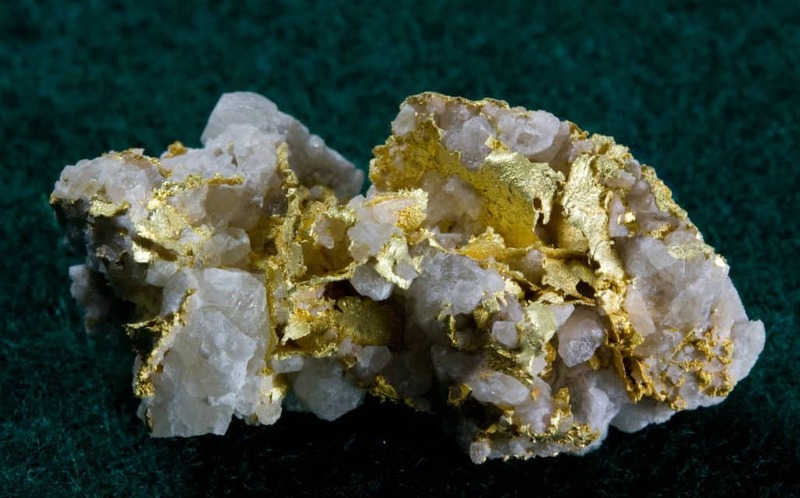 There, within a milky white quartz vein, was an inclusion of gold the size of a nickel. He followed the vein up the slope a ways and found other pockets of gold as well. He hugged his dog and ran back to get some tools. 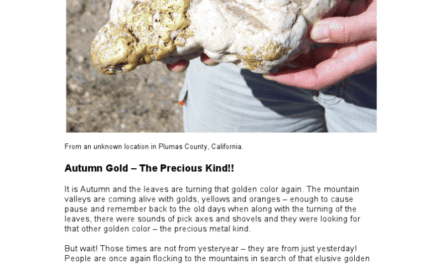 California is blessed with abundant gold reserves. Remember your California history? 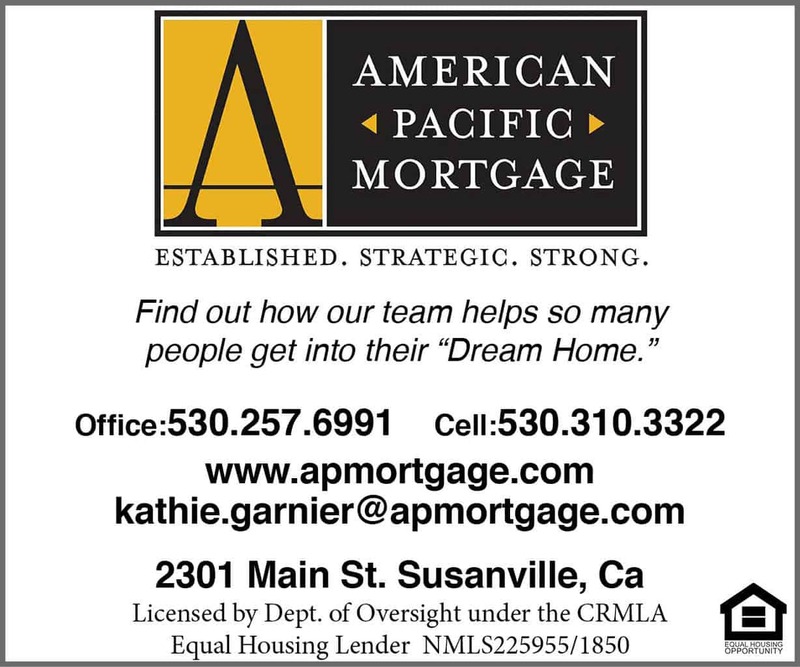 One of the largest gold areas in the Golden State is called the Mother Lode Belt – a 400 mile-long, 75 mile-wide swath of gold-bearing rocks and gravels in the foothills of the Sierra. Numerous old mining towns dot the region with names like Seneca, Quincy, Downieville, Nevada City, Placerville, Jackson, Angles Camp, and Sonora. Each has its own history telling how the gold was discovered, where the richer mines were located, and who the people were that found their fortunes there. For some, it is the history of those times that provided them with their wealth, while for others it is and will always be about the yellow metal. Both are compelling and each will change how you live your life. 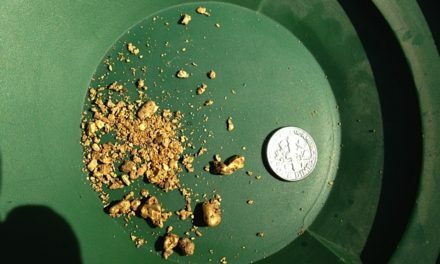 Mining gold from the rock is challenging, yet can be very, very rewarding. Miners have carved elaborate tunnels and shafts miles into the mountains in order to get at the rich pockets of gold. But did you realize that it doesn’t need to be a huge operation to go hard rock mining? Several small-scale pocket miners are busily at work today, pounding on the rocks with hammers and chisels and doing remarkably well. Some even find amazing specimens that fetch thousands of dollars. The gold is usually sprinkled as tiny specks in mineralized quartz veins, with some found in brown oxide veins, all owing to some ancient hydrothermal process. Miners will chip off the rocks, crush them into a powder, and then use water to recover the gold. In the past, miners would only process the rich ore pockets because the processing systems were crude. Today, there are gas-powered rock crushers that pulverize the rock in seconds and shaker tables that act like mechanical gold pans, but are much larger and can process more ore faster. I have a portable crusher that works on a chainsaw motor that I’ve carried high up on the ridges along the Plumas-Sierra County line to test some pretty rich gold veins. My dog likes the view, too. 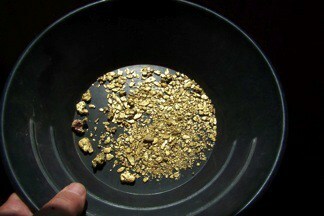 Once the gold is concentrated, it is put in a furnace and melted to 2,200°F to burn off all the impurities, then poured to form gold bars or buttons. Most of the equipment can be purchased online relatively cheaply, and there are several sources, and even videos, for tips and instructions. Sounds easy? It actually is quite simple, just takes a lot of hard work and commitment. Of course once a gold-bearing vein is discovered, the real fun begins. How do you know if there is enough gold to make it profitable? Every miner will tell you that the bonanza is just a little further back in the rock. So, you better ask a mining geologist before you quit your day job. You can also ask for tips on how to mine more efficiently and effectively. 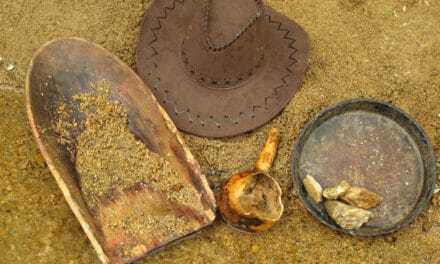 Gold mining is not a new thing. It is something within our blood – something that we feel is right. Today’s miners are smarter than ever before. They have better tools to recover the precious metal and the wisdom to work with Mother Nature. Modern miners are responsible citizens and reclamation is part of their mining process.